BeneFishial™ contains the optimal purity, ratio and dose of Omega-3 and is a simple solution to a number of health risk factors. BeneFishial™ is a pharmaceutical grade Omega-3 providing over 90% pure Omega-3 fatty acids in each capsule for the maintenance of good health. Omega-3 is an essential fatty acid that can only be obtained through diet. Omega-3 is naturally found in cold-water fatty fish. The two major health promoting essential Omega-3 fatty acids are Eicosapentaenoic Acid (EPA), which has a strong anti-inflammatory component, and Docosahexanoic Acid (DHA) an important component of cell membranes that provides significant positive cardiovascular effects. Omega-3 fatty acids are essential to the human body, but are not typically found in the Western diet. This is creating a nutritional deficiency in large numbers and our studies show that 80% of the general population is Omega-3 Deficient (OM3D). BeneFishial™ was created to address this Omega-3 Deficiency. In order to receive the same amount of Omega-3 in the three capsules of BeneFishial™ a person would have to consume fatty fish everyday and at every meal. For most people consuming that much fish is unrealistic, so BeneFishial™ becomes a convenient method for achieving optimal Omega-3 levels for the maintenance of good health. 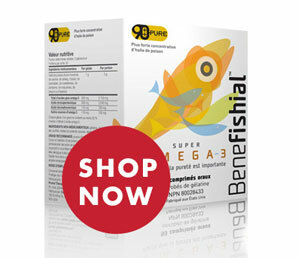 BeneFishial™ is a greater than 90% pure, pharmaceutical grade Omega-3 for the maintenance of good health. BeneFishial™ has a proprietary formulation delivering optimal levels of Omega-3 that promote an increase in blood flow, reduced inflammation and positive effects on blood lipids contributing to the maintenance of good health. 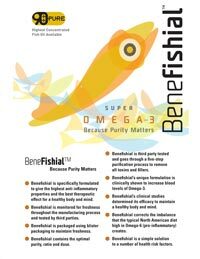 What makes BeneFishial™ different from other Omega-3 Supplements? BeneFishial™ provides over 90% pure total Omega-3 concentrations in each capsule while other Omega-3 supplements typically contain on average concentrations of only 30%-60% per capsule. This high concentration of Omega-3 ensures that there are none of the “fillers” typically contained in over-the-counter (OTC) products working against the positive effects of the Omega-3. BeneFishial™ has an 8-digit Natural Product Number (NPN) 80028433. This number means that BeneFishial™ has been assessed and approved for safety and quality by Health Canada. BeneFishial™ undergoes a five-step purification process to ensure all toxins and fillers are removed. BeneFishial™ is third party tested by an internationally recognized organization to confirm the highest purity and concentrations of EPA and DHA. What is BeneFishial™ daily dose? BeneFishial™’s daily dose is one (1) to three (3) capsules per day, which may be taken with food. Omega-6 is another essential fatty acid found in most processed foods and fast foods that are typical in the North American diet. Excessive consumption of Omega-6 and insufficient amounts of Omega-3 in our diets creates a dietary imbalance of Omega-6 to Omega-3. Many experts believe that this increase in Omega-6 in our diet increases inflammation, cardiovascular conditions, obesity, diabetes and depression. In order to correct this imbalance an individual must increase their intake of Omega-3 and consume less Omega-6. This can be accomplished through diet and consumption of a high quality Omega-3 supplement such as BeneFishial™. Remember to always consult your health care practitioner to see which products are right for you. For further inquires, please contact us by completing the form below.